20 million people are affected by famine in east Africa. 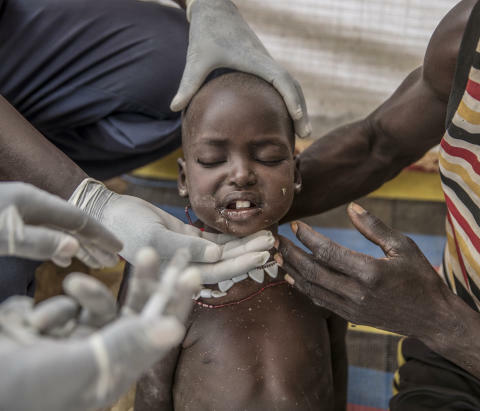 Fotografiska For Life and Aftonbladet TV are now in cooperation to support Save the Children in their work to save the starving and sick children. The exhibition What's on The Plate - what the children eat, by photographer Magnus Wennman and journalist Erik Wiman, presents nine children's horrible situations and also an unique 360-film about little Lochebe who hunt's rats to survive. A boy who used to have a borrowed school uniform and a dream, now he hunts with bow and arrow to try to support his family who lives of nothing then leafs. "We travelled to places where hunger has become malnourishment has become starvation. We wondered - what do people eat when the food runs out? What do the children have on their plate? The material we brought home became this exhibition" says Magnus Wennman and Erik Wiman. And it is done to make people react and become engaged so that this famine gets attention. Sadly media is too silent about this worst famine since World War Two, famine that kills a child every third minute. We hope this exhibition shall change that and the 360 VR-experience really adds a punch to the solar plexus. When you enter the 360 cylinder it feels like you share Wennmans and Wimans experience of being at sight, there together with the people who are starving to death. The situation is especially dangerous for the little ones, seeing as they have a low resistance to the harm around them, many of them has never even seen rain. It was six cameras filming in synchrony, and LED-screens put together shaping a cylinder 43,5 square meters of 174 panels with 700 screws. It is the most modern LED-technique on the market with 3,1mm PixelPitch that creates a image surface of 4800x960px. A project comparable with the worlds first 360-film, from Aleppo that was released this winter.
" It is the first time for us using this advanced 360 technique, we have experimented before with much more simple equipment and it it is of big importance that this technique now also contribute to journalistic work even in very difficult circumstances. It really moves people, and that is necessary", says Magnus Wennman and Erik Wiman. For Fotografiska this Fotografiska For Life-exhibition is a very good example of the power in photography. "Our driving force is always to contribute to a more conscious world, we want our museum to be a place where people get touched and have new thoughts. Something is happening when you meet art - you meet your fellow man and you meet yourself. Now we got the option to meet our fellow man in Africa. That is a great opportunity", says Johan Vikner, exhibition Manager at Fotografiska. Also Save the Children is very pleased with the fact that Fotografiska For Life and Aftonbladet TV does this co-producuction to their benefit. "It is a fight against time to try to save this children and we at Save the Children are very pleased with the fact that Fotografiska For Life and Aftonbladet TV does this together to support our work in the area", comment Elisabeth Dahlin, Swedish Secretary General Save the Children. Fotografiska s one of the world’s largest venues for photography. No ordinary museum, Fotografiska is an international meeting place with inspiring world-class photography exhibitions at its heart. Fotografiska’s mission is to make accessible both established and cutting-edge photography, for knowledge and to experience the infinite expressions and meanings of photography. Fotografiska is a force of positive influence on society, inspiring a more conscious world. Therefore is our price winning food&beverage focused on no waste and saving the planet through serving vegetables with added meat, instead of the opposite.